While the skis are turning because of the other movements and interaction with the snow, counteracting is the rotation of the torso contrary to the way the skis are turning, one of the essentials of skiing1. Related to countering and Coiling, counteracting is specifically defined to be based on the action of the upper body, not a passive result of tip lead or a result of some active lower body twisting. 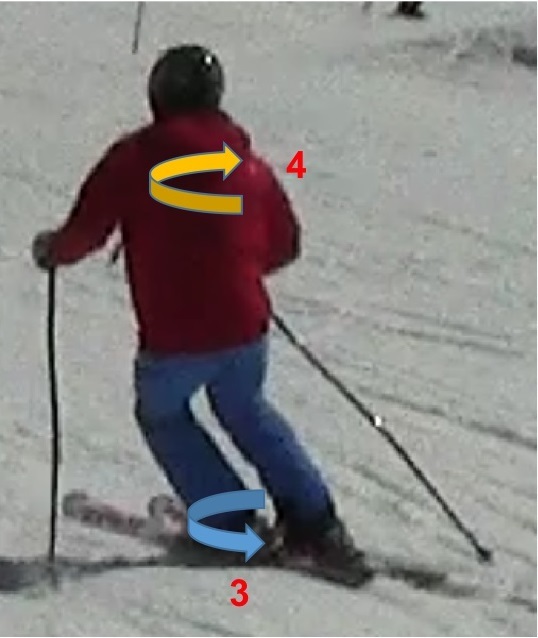 Some like to see separation as a passive notion, of either "skiing into counter" or "passive tip lead" but counteraction and coiling specifically mandates that the torso actively turn opposite to the skis. 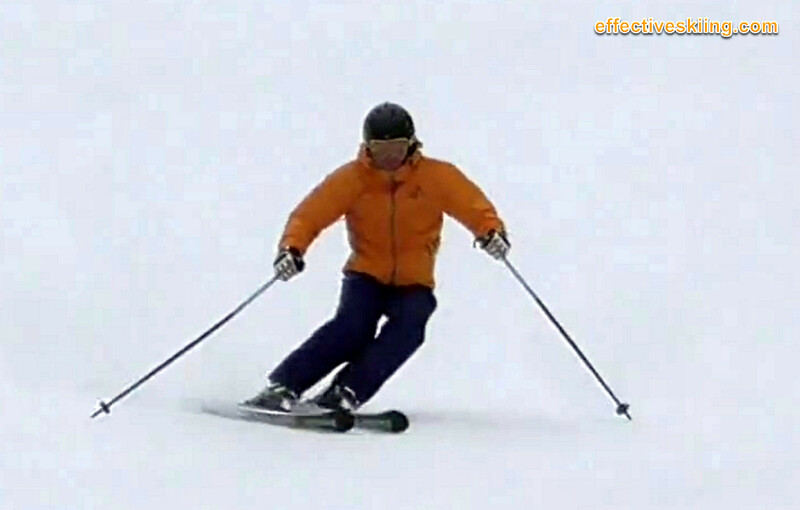 Counteraction it is a component of good separation of upper and lower body and a fundamental movement of great skiing. Counteraction complements counterbalancing as when you're countered, the slight bend forward at the hips also helps balance over the outside ski and these two movements combined throughout the turn, result in great balance and range of motion. Beginners generally focus on moving the shoulders but it is better to focus on moving the hips. Good counteracting includes the hip, trying to minimize torsion on the spine. You may sometimes hear of "letting the legs rotate in the hip sockets" or Femur rotation. That idea is related to counteracting from the hips, but ties it to leg rotation. The "static" look of the result, of the countered relationship between the upper and lower body looks different in different situations: it is important to note that the actual movement matters, not the result. We counteract as needed in, not in a prescribed amount. Note that in SL (short turns) we do not want any excessive rotation of the upper body - you can easily exceed in either direction (too little and too much). These extremes around the fall lines are specific to GS and longer turns. See also Coiling and Steering and coiling for more details. Counter or countered describes a relationship between the upper and lower body, at a point in time, as opposed to a movement. Maximum counter usually occurs at the end of the turn. 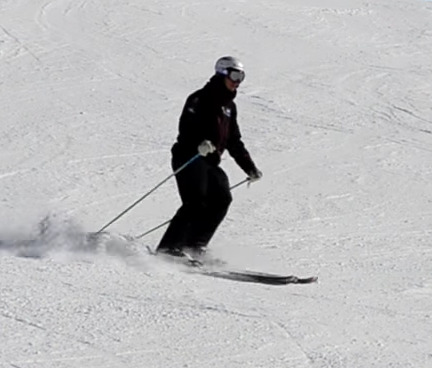 Counteraction is the action or movement that creates the countered relationship, through a specific upper body action, to rotate the hips opposite to and in proportion to the skis' turning. Coiling on the other hand is sometimes seen as a lower body as well as an upper body action. Coiling is also generally used in racing circles, denoting a "strong" separation, involving more "energy" and "torque" than we find needed in average skiing. While counteraction is a continuous movement, coiling is generally emphasized around the end of the turn, where the "torsion" is created, so counteraction seems to send the better message: we can say that counteraction is how we create coiling. Pivoting the femurs in the hip sockets is another action or movement that creates the countered relationship, by rotating the femurs into the turn, "under a stable upper body". The differences are not just about philosophy and point of view as to what the skier should focus on - the action on the snow is quite different. The femurs will always pivot in the hip sockets, for good separation, around several axes, the question is why? Is that a result or an action? If the desired result is pivoting the flat skis, then the focus could be on the femur pivoting while the hips still rotate to the outside. If the desired result is solid carving, then focus could be more on edging while counteracting the hips. In fact, focusing on rotating the femurs generally leads to pivoted turns, while a specific focus on carving more will lead to counteracting, see Femur rotation. The counteraction movement starts early in the turn and continues throughout the turn, while the coiling and/or countered relationship between upper and lower will appear late in the turn. Anticipation is an older term, not really used anymore, to denote the same notion of counter. 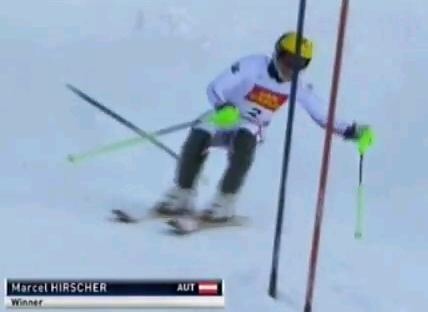 Counteraction is done as a compensation for the skis' turning. This means that the counteraction should be done throughout the entire turn, rather than specific points in the turn. Member-only content avilable (193 words). Member-only content avilable (98 words). Viewed 1914 times ( | Print ) this page.